so i have been away from blogging for quite some time. to say the least, i have been in a major funk since linus died in february. i haven't had my usual blogging spark. AND THEN our summer started out pretty darn crummy, leaving me in an even bigger funk. let's just say, dealing with loss is NOT my forte. several readers who haven't known what all was going on asked what happened to my blog and i didn't really have an answer other than i just haven't felt like blogging. the other day a dear friend and fellow blogger who had quietly noticed my lengthy absence convinced me to pick up my chin and forge onward into blogland. ;-) she told me to go for it and said "maybe this is the closure you need." despite the lame-o beginning, we have ended up having a truly fantastic summer. hot and very busy. i can't wait to update you. it may take a few posts but i'll get there. 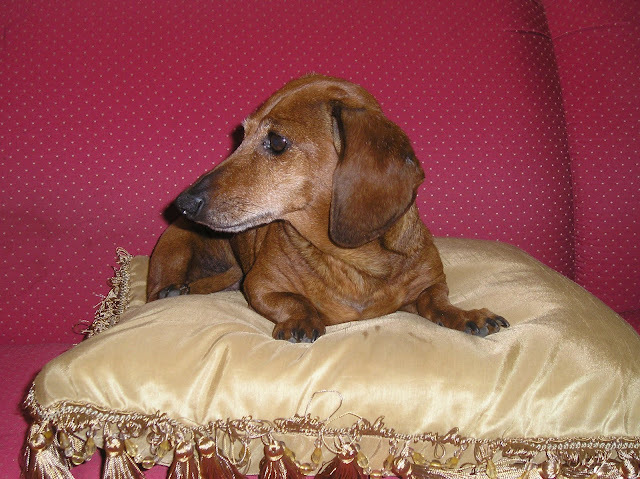 but first...the main cause of my EVEN deeper funk was the death of our 15 year-old dachshund, Dixie on may 29th. i am a HUGE dog lover and quite frankly, worshiped this little dog for 15 years. she died very tragically and certainly not the way i had hoped she would leave this world. in hindsight, i'm pretty sure it was more tragic for me and my family than her passing was for her. at any rate, i still have horrible visions of that day and what i could have done differently. ironically, we took her to the lake with us that weekend to keep an eye on her because she was just moving very slow and looking all of her age. i was fearful that if i left her at home with my mom and dad to dog-sit that they may have to call us with bad news. i didn't want her to be alone when she left us. so fortunately, she was surrounded by me, shannon, and the boys, as well as our dear friends, the gibsons who also loved her very much. i really can't believe i'm writing this post. it was only 3 months ago that i did this for our beloved linus. i have NO clue where to begin. you were the best dog EVER. i can't believe you are gone. i saw your sweet face and watched you wag your tail for 15 fantastic years. God certainly knew we'd be the perfect pair. i needed you as much as you needed me. we learned so much from each other. unconditional love, patience, respect, loyalty, and what having a true best friend was like. you made me laugh. you made me scream. you gave me a soft place to put my head when i cried. you snuggled with me many, many times. you kept my feet warm. you gave me companionship. dixie, you were a legend in your own time, a fixture among the tronco-baker family. you carried me through college, being a newly-wed, a new mother, and life in general. i remember sitting with you on the morning of our wedding, june 5, 1999. i told you i was going on a trip and you gave me that sad little shiver like you used to do, like you knew i was leaving. i told you not to worry because i'd be back soon with a surprise...your daddy! we would finally be a family! you were the happiest dog on the planet from that moment on. you meant so much to our family and all our friends you met along the way. they all just loved you. the forest acres community loved to see you run the streets as you blazed your trail. i'm sure they loved to see me chase you as you ran even more. you kept me on my toes and definitely made a mark on my heart and the hearts of all who knew you. the circumstances which became your death were quite possibly one of the most traumatic things to happen to me thus far. i hope you know that your daddy, katie, and i tried VERY hard to revive you. i wasn't going to let you go without fighting for you. but i guess it was truly your time. muzzy said it best, "she died in the place she loved the best." that is no doubt, my beautiful girl. some of my favorite memories of you are watching you sun bathe on warm afternoons outside or in a sunny spot on the carpet inside on cool days. you were always workin' on your tan. i loved watching you "walk the trail" of our backyards and show simba, linus, and wally the ropes. i loved that you were the ultimate alpha! a diva. an icon in my life. you always had stuff up your furry sleeve. you were so mischievous and got in more trouble. i'll never forget the "manwich night" when you attacked poor linus over a 1/4 of a teaspoon of meat that fell on the floor. the poor dog had a manwich-stained neck after you made your point. i loved the annoying way you'd wake us up each morning. you were without a doubt one of the best looking dachshunds i've ever known. i would sometime just stare at you in awe of your perfect little nose, precious shape, and gorgeous red coat. i could go on for days! you were so amazing with the boys. i know they probably drove you crazy but WOW they loved you so much. thank you for teaching them what a good pet is. though they may not remember you very well in years to come, i have lots of stories and pictures to prove that you and linus were their first pets and that you both welcomed each one of them with open paws. i love you, beautiful girl and always will. i can't begin to tell you how different and empty my life feels without you right now. i know it will get easier, but i sure do miss you and can't believe you're gone. i hope the rainbow bridge is as beautiful as you deserve!!! i hope you're feasting on as much manwich as your belly can hold and that you have an abundance of toys with squeaker to gut, leaving the fuzzy carcass for linus. i hope there are lots of holes to practice your olympic digging and blankets to burrow under when you sleep. rest in peace, sweet doggie and know that you served me well and were truly man's best friend! You did it...so proud of you. I started sniffling while reading; Maggie came in, laid her head on my lap, looked up at me, and said, "It's okay, Mama." She then proceeded to pat my hand while I finished your blog about Dixie. Such a sweet entry, Claudia. I know, I know. Sorry to hear about your loss of a great friend. My dog died a tragic death in december. glad to see you back blogging tho!